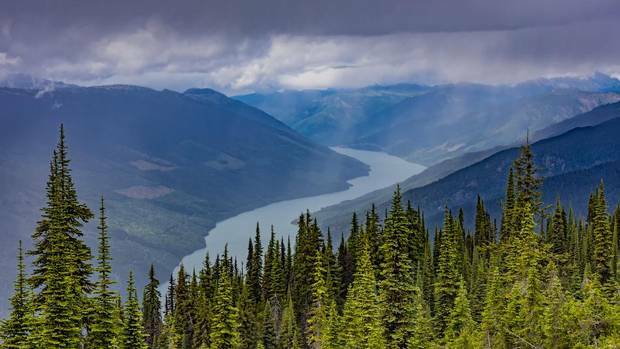 An elevated view of Lake Revelstoke from Mount Revelstoke, B.C. CHORUS: Roll on, Columbia, roll on. 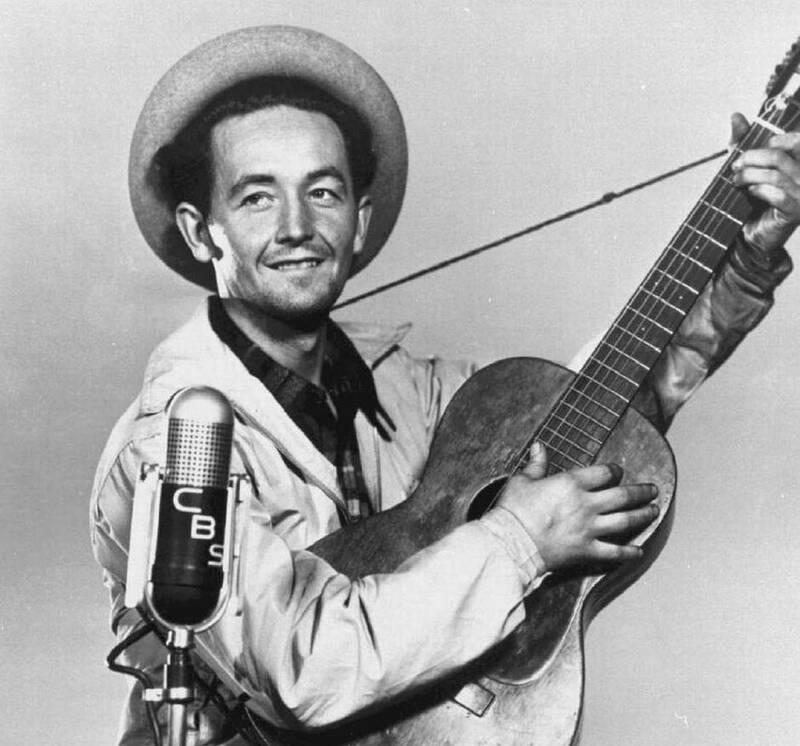 It is difficult to imagine, 75 years on, America's most famous folksinger-activist – a man who admired communism and who wrote This Machine Kills Fascists on his guitars – working for a big power company, but it happened. It was 1941 and Guthrie, out of work in California with a wife and three young children to support, agreed to a month-long contract with the Bonneville Power Administration in the Pacific Northwest. For a sum of $266.66, he would travel about the Columbia and write songs about the great river that begins in Canada's Rocky Mountains and empties into the Pacific Ocean at the Washington-Oregon border. That Guthrie would take on such a contract is a stark illustration of how perspectives can change over time. There was no environmental movement in those days. In 1941, hydroelectricity was seen as natural, clean and cheap enough that it would improve the lives of farmers and the poor. Guthrie approached his assignment with great enthusiasm, writing 26 songs that extolled the power agency and development. He sang about ports being built for "shiploads of plenty." He called the Grand Coulee Dam "the mightiest thing ever built by man," a magnificent project that would "run these great factories and water the land." The dam was 1.6 kilometres across and created a lake with almost 1,000 kilometres of shoreline. President Franklin Delano Roosevelt said the electricity it produced would bring new opportunities to those who had seen none during the years of the Great Depression. Guthrie, not surprisingly, thought that an admirable goal – unaware that soon the United States would join the war, and the power drawn from the Columbia River would be used for other purposes. It would be sent to smelters for aluminum used to manufacture warplanes. It would be used to power the reactors that produced material for the atomic bombs that would be dropped on Hiroshima and Nagasaki. The Hanford nuclear site, at one point with eight reactors up and running, would eventually be dumping 50,000 curies of radioactive material a day into the Columbia River – a fact kept secret for decades. Though the reactors were decommissioned toward the end of the Cold War, Hanford remains the most contaminated nuclear site in America. But none of that was known in 1941, of course. Guthrie's Roll on Columbia became such a hit that it was covered by dozens of performers, from Harry Belafonte to the Canadian folksinging group The Travellers. As his friend Pete Seeger would say many years later in a short documentary on Guthrie's Columbia River ballads, "People aren't quite so enthusiastic about building dams." Canada's most charming statue stands in a small park in the B.C. Rockies town of Invermere. It is a tribute to exploration but also to marriage – specifically that of David Thompson, the Great Mapmaker, and Charlotte Small, the half-Cree woman he married when he was 28 and she was only 13. They stayed together 58 years; Charlotte and several of their 13 children often accompanied the explorer on his journeys. When he died, penniless and forgotten in 1857, the family buried him in Montreal's Mount Royal cemetery, where it is said Charlotte lay weeping throughout the night on the fresh grave. Three months later, she was buried beside him. "The man who measured Canada," the engraving on the statue's plinth reads. He was also the first white man to descend the length of the Columbia River. The gaping mouth of this vast river had been crossed in 1792 by American sea captain Robert Gray, who named the river after his ship, the Columbia Rediviva, but Capt. Gray did not travel far upstream. A few years later, when a British map showed this unknown river connecting to the Missouri River (the map was wrong), competing fur traders became convinced that if they could find the source of this river, it would open up the Pacific coast to great new trade possibilities. Thompson, then working for the North West Company, was assigned the task of finding that source. It took him several years – he lost a full year by mistaking the Kootenay River for the Columbia, he was once turned back by unfriendly Peigans – but he eventually reached the mouth of the Columbia on July 15, 1811. The waterway Thompson had travelled follows a twisting, difficult route that covers 2,000 kilometres from Columbia Lake near Invermere to the Pacific Ocean. It actually flows north at first, turning slowly westward and then, as it passes by the Selkirk Mountains, turns abruptly south, passing through Revelstoke, the Arrow Lakes, Castlegar and Trail. 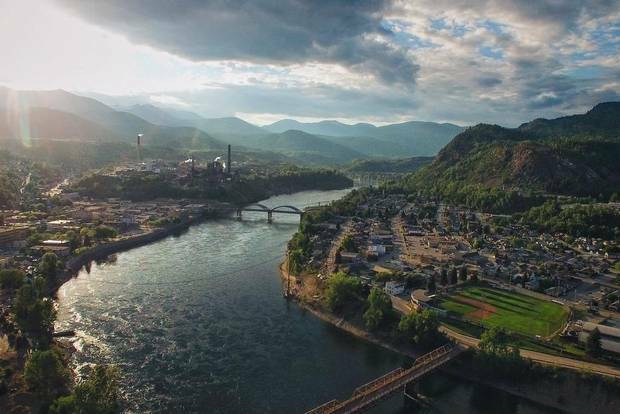 Joined now by the Kootenay, which also flows west out of the Rockies from south of Invermere, it enters Washington State, joins with the Spokane River, the Okanogan River and the Wenatchee River before turning west to form almost 500 kilometres of the Washington-Oregon border. Water is released through the outlet tubes at Grand Coulee Dam, Wash. So dammed, in fact, is the Columbia that it has lost its original seasonal patterns. A century ago, three-quarters of the flow occurred from April through September. By the end of the 20th century, the flow was split almost equally between April through September and October through March. "This river may have been shaped by God, or glaciers, or the remnants of the inland sea, or gravity or a combination of all, but the Army Corps of Engineers controls it now," Timothy Egan wrote in his 1990 book The Good Rain: Across Time and Terrain in the Pacific Northwest. "The Columbia rises and falls, not by the dictates of tide or rainfall, but by a computer-activated, legally arbitrated, federally allocated schedule that changes only when significant litigation is concluded, or a United States senator nears election time. In that sense, it is reliable." Three of the 14 hydro dams are in Canada. Nearly half of all hydroelectric power used in the United States of America comes from the Columbia River, the north-and-south dispersion of that power controlled by the Columbia River Treaty that was signed between Canada and the United States in 1964. That pivotal treaty is now up for renewal. Guthrie was certainly enthusiastic about the possibilities that cheap electricity would open up. His songs in praise of development along the Columbia River were public. His growing concerns, however, he kept to his private correspondence. From Portland, he wrote to his old friend Millard Lampell, a fellow musician who, along with Seeger, was a member of the Almanac Singers, a group that sometimes included Guthrie. "Some of the factories are dumping refuse and chemical garbage into the nation's greatest salmon powerstream, the Columbia River," Guthrie said in his letter. "Millions of fish are destroyed and the Indians are plenty sore. The dried salmon means grub for the hard winter. A disposal plant was offered the company for a few thousand dollars, but the company refused. All running water is public property under federal law – why this poisoning of the river?" With the war effort, it would get worse – much worse. And following the war, development along the length of the Columbia would bring more pollutants. Slag from the lead-zinc mines around Trail, B.C., has covered the river bottom for great distances. Pulp mills have been blamed for mercury poisoning. At Hanford, it was estimated in 2008 that one million U.S. gallons of radioactive waste was slowly working its way through the groundwater. One estimate warned that if the cleanup was not completed, the waste would reach the river by 2020. Such abuse of a watershed seems improbable for one that contains or touches on Yoho National Park, Glacier National Park, Mount Revelstoke National Park and Kootenay National Park in Canada, and Yellowstone National Park, Mount Rainier National Park, North Cascades National Park, Glacier National Park and Grand Teton National Park in the United States. It also is the traditional home to dozens of North American indigenous groups – all of whom relied on the bountiful salmon runs as a major source of food. High upstream at Revelstoke, where a massive dam was constructed in 1979, the estimates of fishery losses has been pegged at 4,000 Dolly Varden trout, 1,000 rainbow trout and 500,000 salmon a year. Scientists believe that, prior to the damming of the Columbia, salmon runs in the system would run as high as 16 million fish each year. With the dams in place, the biggest run in recent times was 1986, when 3.2 million salmon entered the Columbia. While fish ladders, when installed, can aid adult salmon in getting to spawning grounds, the fish in most danger are the juvenile salmon driven to return to the ocean – only to end up being shredded in turbines or dying in stagnant reservoir backwaters. The Columbia River flows through Trail. 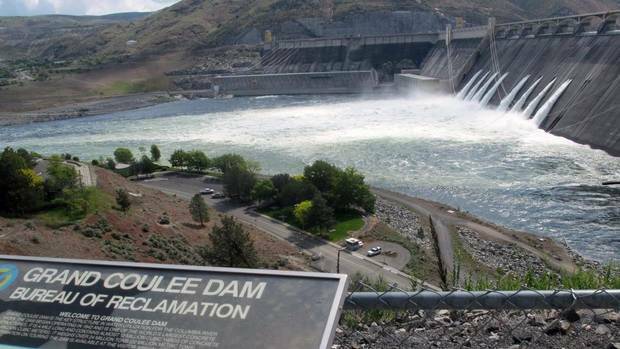 …The Bonneville Power Administration spends many millions a year on restoring salmon runs south of the border with limited success because of the dams. There is even a program that carries young salmon past barriers by barge and truck. North of the border, most of the salmon that are found are landlocked. Robert Sandford, the EPCOR chair for water and climate security at the United Nations University Institute for Water, Environment and Health, has written extensively on the Columbia and other rivers in the Rockies. The blocking of the salmon runs, he says, was an assault on the culture of the region. "Wherever we find salmon," the resident of Canmore, Alta., has written, "we also find indigenous peoples whose cultural heritage has lined them directly to the ecological energy of the Columbia River for hundreds of generations." According to a 2016 report by the World Wildlife Federation-Canada, the Columbia watershed is very much at risk. Where WWF-Canada found some hope is in the watershed's ability to cleanse itself. Water flow remains good, even with the dams, and researchers found no serious decline in the native fish. Columbia Lake, for example, flashes orange each fall with small landlocked salmon that live out their entire lives near the source. The notion behind the Columbia River Treaty was simple. If Canada agreed to control the flow of the upper Columbia to maximize the hydroelectric dams, then the United States, to be fair, would share some of the power generated downstream in the American portion of the river. While next to nothing has been said in Canada about the renegotiation of this important treaty, the same cannot be said for the Pacific Northwest of the United States. State politicians have been pleading since 2014 for federal State Department officials in Washington to get on with it. U.S. senators and representatives from four states in the area have written to Washington requesting that the talks begin and that Canada be prodded to appoint a chief negotiator. In early October, 2016, it was announced that the U.S. State Department had finalized its Circular 175, which outlines and authorizes the talks with Canada. Canada had refused to begin discussions until the parameters of the new talks were outlined. Hydroelectric power generation and flood control are priorities, obviously, but these talks will also take into consideration ecosystem functions and various community concerns, including those of indigenous groups. When the treaty reached its 50th anniversary in 2014, it came open to review. Canada receives about $250-million worth of power each year from the "Canadian Entitlement" in the treaty, and some U.S. officials consider that "excessive." Utility providers claim electricity prices are high because of this Canadian payoff. Others say the flood protection Canada provides is worth much more than any annual entitlement the Americans send north. As well, indigenous groups on both sides of the border are using the opportunity to review as a chance to push for the return of the salmon runs that were largely destroyed by the building of the dams. The Columbia River Inter-Tribal Fish Commission (CRITFC) is active in the lower reaches of the watershed, and the Upper Columbia United Tribes (UCUT) is a coalition that represents indigenous interests on both sides of the border and is determined to see ocean salmon return to the Columbia. Indigenous voices were not a consideration back in 1964, says Brett VandenHeuvel, an environmental attorney who serves as executive director of the 12,000-member Columbia Riverkeeper, which is based in Hood River, Ore. "The treaty," he says, "was essentially about power and flood control." As Mr. Sandford wrote in a recent United Nations University paper on the situation, "the indigenous peoples of the Columbia Basin are not going to let the injustice to which they were subjected in 1964 happen to them again." The area is far more politicized today than it was a half-century ago. Not only are native interests well organized, but there are environmental groups active today that did not exist in the early 1960s. Columbia Riverkeeper, for example, is celebrating victory this fall after a 12-year battle to stop the building of new liquefied natural gas terminal near the river's mouth. 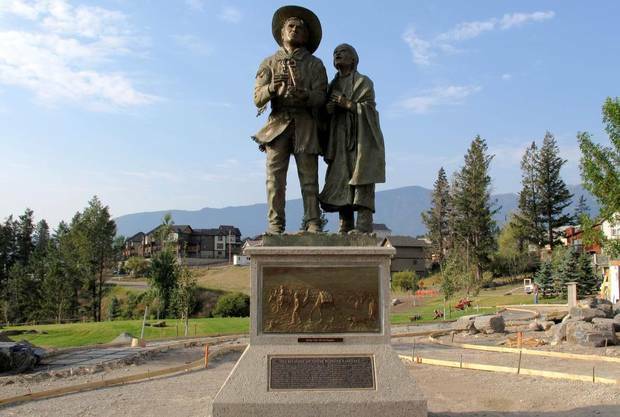 Photos of Explorer David Thompson and wife Charlotte Small statue in Invermere, B.C. Mr. VandenHeuvel says the area is particularly attractive to those who would export resources, with talk of new coal and oil terminals to serve growing Asian markets. "It's one of the most threatened rivers in North America," he says. The head of Columbia Riverkeeper is not without optimism, however. "We can manage the system in such a way as to help the salmon, in ways that aren't just about producing the most power all the time," Mr. VandenHeuvel says. "I'm hopeful that we will have a more modern treaty that incorporates clean water, adequate flow and surviving salmon, instead of just having it be this antiquated idea of 'We'll hold back water, you produce power – and give us the money.'" Mr. Sandford, who has studied the treaty for years, told The Globe and Mail that the treaty "is almost dizzying in some ways." Consideration will need to be given for the power, agriculture and industrial sectors, but also to such pressing factors as fish protection, water quality, climate change and, of course, the indigenous concerns that were ignored a half-century back. "I think you're going to see aboriginal peoples on both sides of the border linking together as never before, in ways they have never done before," he says. 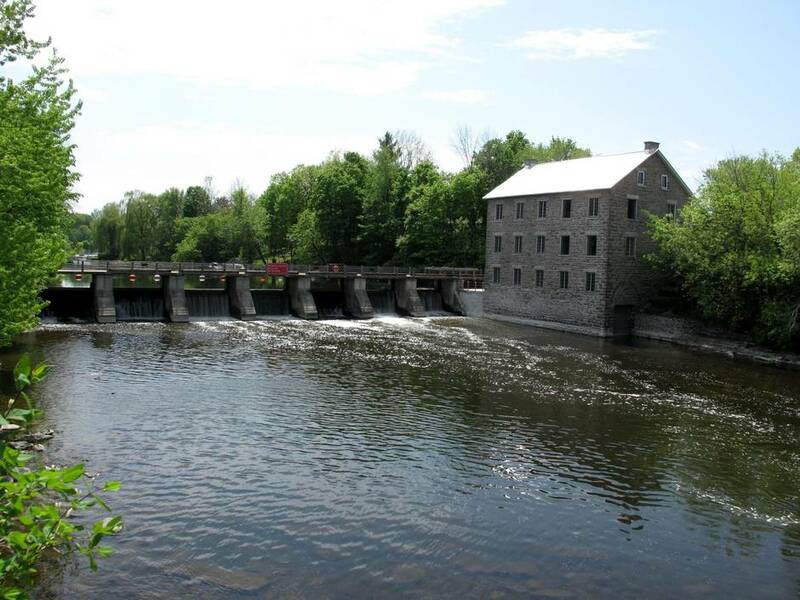 Mr. Sandford has no fears that the Canadian Entitlement will be lost, because he says the value of the flood control Canada provides is greater than the value of the electricity sent north in exchange. "The Canadian hand here is quite good here if they handle it properly," he says. "There's tremendous pressure to get this one right. And if we don't, then there are going to be huge consequences."